Using a detachable design BedShelfie minimal bamboo nightstand delivers a simple and useful way to hold your items beside your bed. Like the idea? Let’s keep checking. 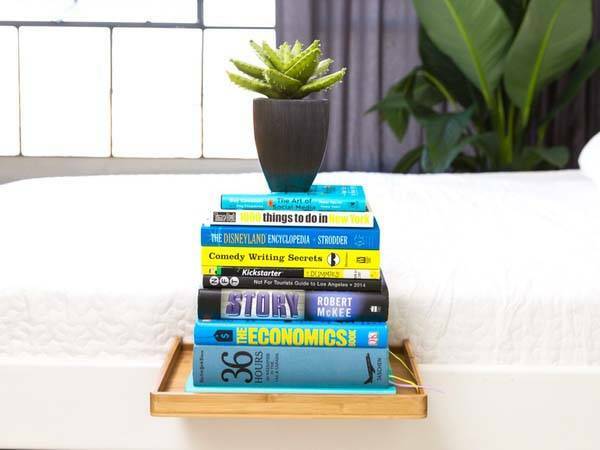 The BedShelfie is an innovative and practical removable nightstand that weighs approx 3.5 lbs. As we can see from the images, the nightstand shows off a sleek and minimalistic appearance design, and it’s handcrafted out of bamboo, which delivers a solid construction, beautiful and one-of-a-kind bamboo grain. Meanwhile, the minimal and clean design with two optional colors allows it to blend well with different interior styles. The compact nightstand features a unique detachable design that allows it to fit on nearly any bed frame, and using a clamping system, the nightstand is capable of holding up to 15 pounds of your most important bedside items within your arm’s reach, and its thick felt padding on the clamp touch points is designed to prevent your bed from getting scratched. 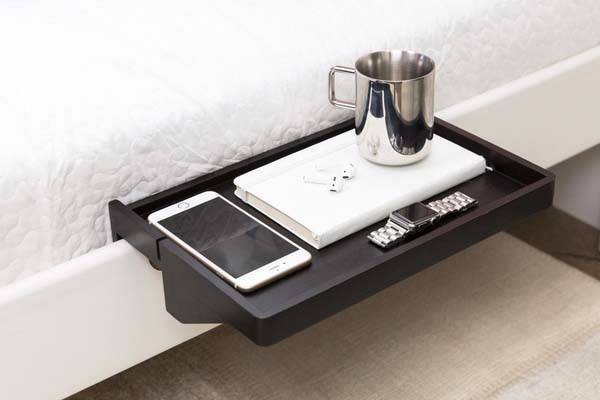 The BedShelfie’s surface area measures approx 12.75 x 8.5 inches so it’s wide enough to accommodate your smartphone, books, mug and other items. 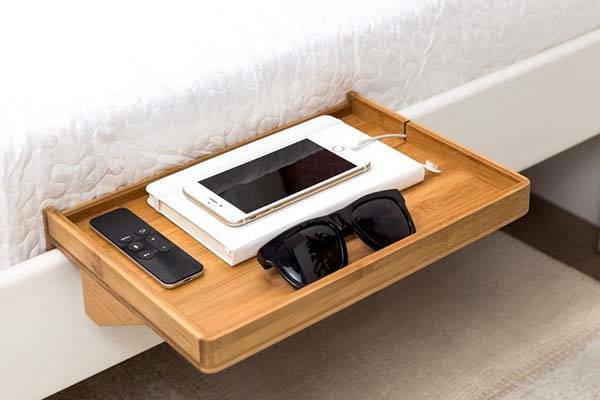 Moreover, a custom wire slot makes a charging cable go through for charging beside your bed. When not in use, the nightstand can be removed from your bed for saving valuable space. The crowdfunding campaign for BedShelfie is ongoing on Kickstarter. Pledging $30 will let you own the detachable nightstand. It will be shipped in May 2017 (estimated) if reaching its funding goal.